In 1939, at age 28, Herman Baker opened a used bookstore with fewer than five hundred books. Just ten years later, Baker Book House was distributing large volumes of new and used religious books in the United States and abroad. During the decades that followed, Herman and his son Richard grew Baker Book House book by book—and brick by brick—overseeing the development of the publishing house and retail bookstores in Michigan. In 1992, Baker doubled in size by purchasing the venerable Fleming H. Revell Company and Chosen Books. 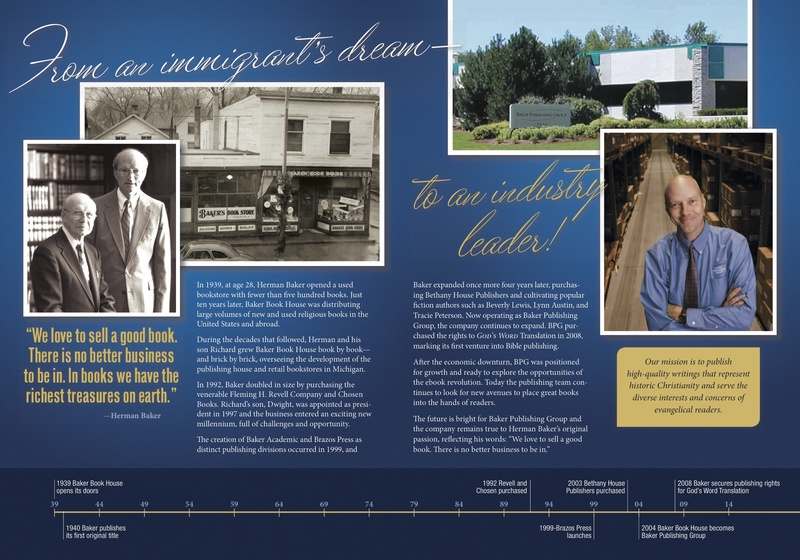 Richard’s son, Dwight, was appointed as president in 1997 and the business entered an exciting new millennium, full of challenges and opportunity. The creation of Baker Academic and Brazos Press as distinct publishing divisions occurred in 1999, and Baker expanded once more four years later, purchasing Bethany House Publishers and cultivating popular fiction authors such as Beverly Lewis, Lynn Austin, and Tracie Peterson. Now operating as Baker Publishing Group, the company continues to expand. BPG purchased the rights to GOD’S WORD Translation in 2008, marking its first venture into Bible publishing. After the economic downturn, BPG was positioned for growth and ready to explore the opportunities of the ebook revolution. Today the publishing team continues to look for new avenues to place great books into the hands of readers.